This post is sponsored by Safeway stores-Safeway, Dominicks, Tom Thumb, Vons, Randalls. Tastier for the holidays! 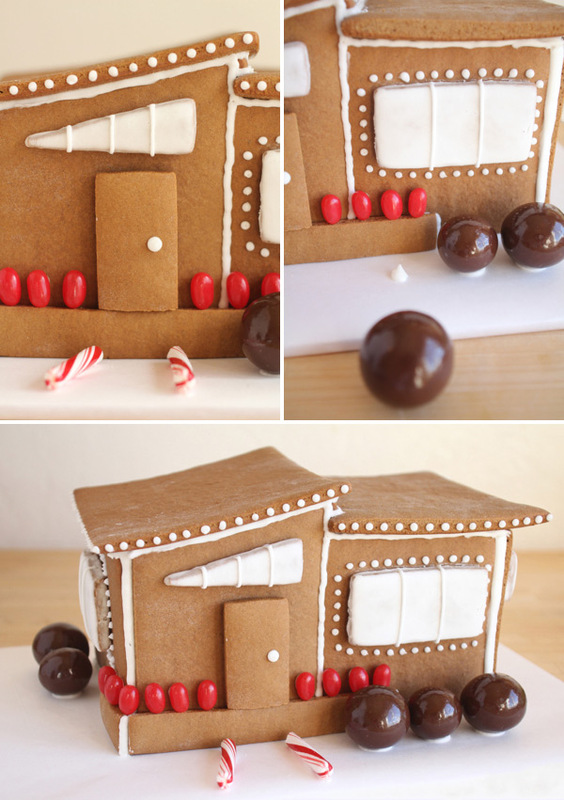 I love a good gingerbread house but I thought it would be fun to do do a modern one instead of the old traditional type. Here are instructions how we made this little modern house that any design lover could get excited about. There is a free template below that makes this project super easy. Click through for the full photos and instructions. Step 1: Make your gingerbread dough. We used this recipe and one batch was the perfect amount for this house. Step 2: Roll the dough out til it is about 18″ x 18″ and 1/4″ thick. Step 3: Lay out the template pieces on the dough before you begin cutting to make sure you’ll have enough dough. If necessary, roll the dough out just a bit thinner so all the pieces fit. Step 4: Cut along the lines of the template. Step 5: Carefully transfer the pieces to two parchment lined baking sheets. Bake according to your recipe and allow to cool. Step 6: Once your pieces are cool, if they puffed while baking, you can use a serrated knife or a fine grater to straighten the edges. Step 7: Mix up a recipe of royal icing. Reserve a few tablespoons of icing in a small bowl, and fill a piping bag fitting with a coupler and a small round tip with the rest. Step 8: Add a spoonful of water to the small bowl of icing and stir to thin. Spoon over the four windows and use a knife to spread to the edges and allow to flow over. Set the windows aside to dry. Step 9: Prep a surface for your gingerbread house. We used a cutting board wrapped in parchment, but a piece of cardboard would also work. Lay out the walls of your house and mark the spot on the board where you want your house to sit. Step 11: Repeat with the next wall and stick into place. On the back side of the joint, pipe another line of icing and smooth onto the inside of the walls. Keep putting up your walls, propping them up as necessary until all six walls are in place. Allow the icing to set for a bit. Step 12: Pipe a line of icing along the top edges of the walls on one side of the house, and put the roof in place. Repeat on the other side of the house. Allow to set up for a bit longer. Step 13: Once your windows are dry, switch to a thin round tip and decorate the windows. Step 14: Use icing to glue the porch, front door and windows to the house. Step 15: Decorate the house with any more icing details, like christmas lights and a door knob, then decorate with candy, using icing to stick in place. That is so cute! I always love looking at gingerbread houses! So cute. There are a lot of houses in my neighborhood that look like this. I may need to create a bungalow version to look like our house. um, love this! 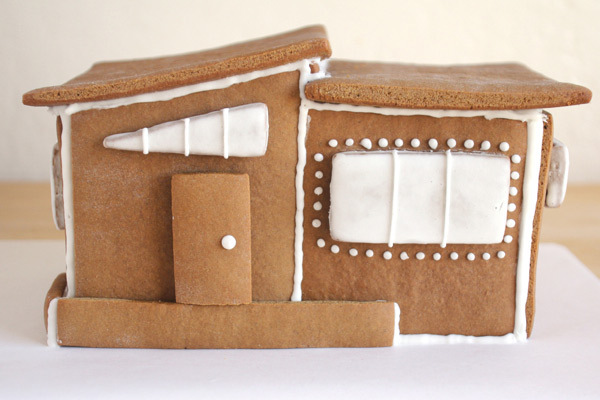 we are doing christmas in santa fe this year, so we are making gingerbread casitas! I have been looking for a ginger bread house to make since the beginning of December! Thank you so much for posting this, it is exactly what I have been looking for! Love this!! So very Lars Bang + perfectly matched to our mid century modern aesthetic! pretty cute. i particularly like the use of malt balls, which like like modern sculpture (topiary?). This is such a fun idea! It makes me think of the houses in Edward Scissorhands. Lol this is so stinkin cute. Definitely sharing this on twitter! lovely! i was going to do a modern gingerbread house! we have an eichler (home) and thought it’d be great to do an eichler-style house! Oh my goodness, this is brilliant! It looks suspiciously similar to our bungalow! Just needs some dogs and a kitten in the yard. oh nice and colorful… Great work..! holy moly. This gingerbread house is so cute I want to hug and kiss it. I love the way your mind works. My favourite gingerbread house. Ever. Love this! I was just looking for unique ideas for gingerbread houses. I’m definitely going to attempt this! love love love this. nicely done. 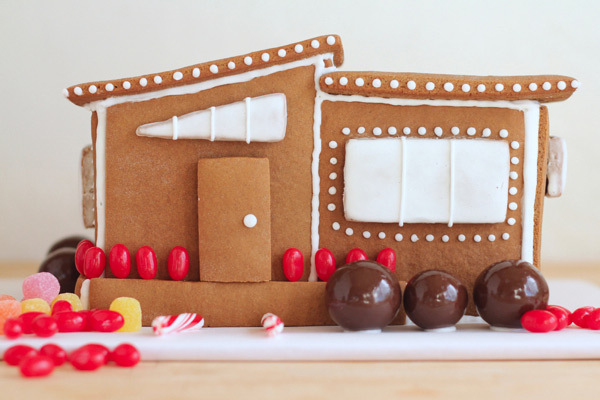 Nice modern touch on a traditional gingerbread house, love the bushes! I’m saving this link for the years to come when my daughter is old enough to make gingerbread houses. This is awesome! Just download the Xtimas Props!! Thanks for sharing your beautifull ideas!! I love your page!! 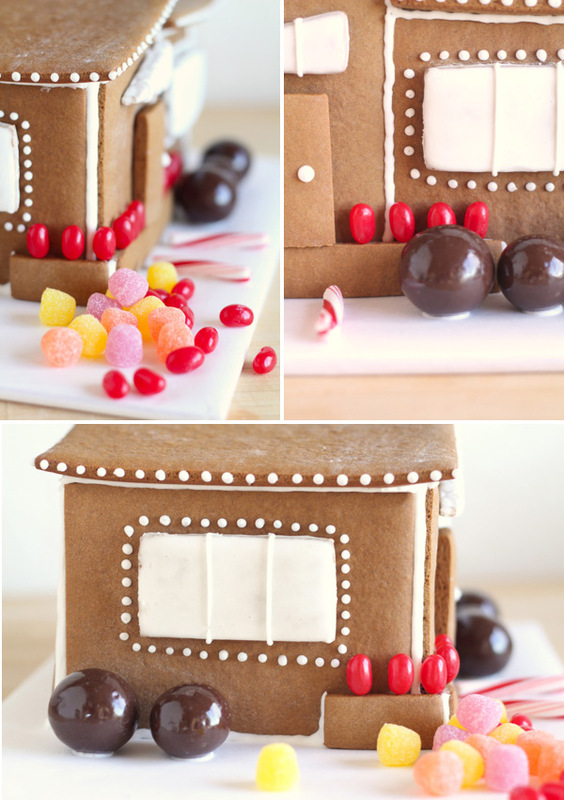 I’ll do this gingerbread house with my kids this week. This is a wonderful idea!! thanks for sharing! Frank Lloyd Wright would be proud! Wow! This is so chic! My house is a little more traditional, but maybe next year I’ll try something more modern.